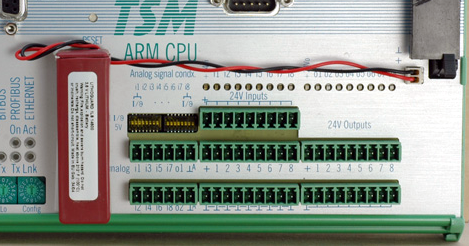 The new TSM-standard-CPU is our handyman of control engineering: A high-performance-CPU with large memory for statistics, logging and optimizing; serial interface for RS232 (2x), CAN, RS485 (BITBUS) and Profibus for communications and protocol converter functions; process-i/o for high industrial demands. 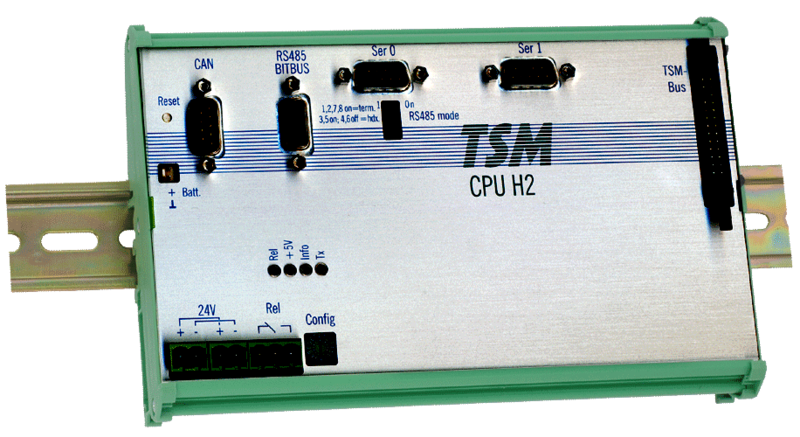 All that in a highly compact form and extensible with all the plenty of TSM-i/o modules. Module with 32bit-memory: 2MB flash-EPROM and 2MB RAM, with i/o, without CAN and Profibus. Module with 32bit-memory: 2MB flash-EPROM and 2MB RAM, without i/o, CAN and Profibus. Module with 32bit-memory: 2MB flash-EPROM and 2MB RAM, with i/o, with CAN and Profibus. Module with 8bit-memory: 512K flash-EPROM and 128K RAM, with i/o, without CAN and Profibus. Module with 8bit-memory: 512K flash-EPROM and 128K RAM, without i/o, CAN and Profibus. The TMP95C241 processor is currently the most powerful Toshiba TLCS900 family member; not only due to its 32bit-architecture, but also due to further optimization of the instruction execution time. 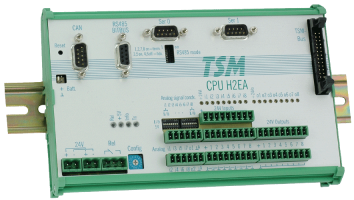 Of course, the „H2" Code is still compatible with the TLCS900-processors that are used on most ELZET products. This means that transition from other products is quite easy since only i/o-access has to be adapted (not even that when using Express-I/O). CPUH2 is programmable in C with cross-compilers on DOS/Windows. The realtime operating system mCAT offers modern multitasking functions with message based communication between tasks and to the interfaces. I/o-functions such as "read input“, "set output“ etc. are abstracted by "Express-i/o“ from the low bit levels. Express-i/o makes available functions, i.e. for edge detection and event counting, at normal digital inputs. The operating system, mCAT, is - just as applications later on - to be downloaded into the flash on the CPU via "Bootmon". The boot-monitor is situated in an 8bit-flash-EPROM, beyond that there is a difference between the 8bit and the 32bit configuration: on the 8-bit configuration the mCAT is also loaded into the Bootmon-flash-EPROM. The application is put there too, for this purpose there are more than 300KByte of free memory, more than enough for most control tasks. On the high-performance configuration the operating system and application (with help of the Bootmon in the 8bit flash) are stored in two 16-bit flashes, which are not mounted in the 8-bit configuration. This way the operating system functions also gain a lot of speed by the 32bit-access. All programming and deleting of pages (blocks) in the Flash-EPROM is being done by monitor instructions or over the BITBUS. mCAT optionally supports programming into the RAM for test mode (also auto starting, if battery sustained) and into the Flash-EEPROM. The RAM can be backed-up optionally by a large lithium cell, which is clipped to the case, and which also supplies the highly accurate I²C-realtime-clock. The battery is able to ensure long backup time and can be exchanged when the module is operating. There is also a serial EEPROM at the I²C-bus with 256 words for storing configuration data, like network address, serial interface speed etc . Beside that, there is a rotary switch with 16 positions that can be set by the user for example to choose a special application or operating mode. The CPUxxH2 has two standard UART interfaces, those are RS232-driven and are accessible through two 9pin D-connectors. RTS and CTS are supported as handshake signals, DTR is acitvated hard when the CPU is turned on. A Z16C32 enables asynchronous and synchronous transmission as third serial interface, i.e. HDLC and SDLC, which are used by the operating system for operation as BITBUS fieldbus interface. The interface is implemented as RS485 half-duplex-interface accordingly, but can also be switched to full-duplex or RS422 point-to-point with DIP-switches. A termination, as it is required at the physical end of the cable, can also be turned on with the DIP-switches. The BITBUS-support in mCAT provides direct access by the sofware from the master (PC?) up to the last TSM-module. A large part of the Express-i/o-functions can be directly used over the BITBUS. The TSM-CPUH2 is ideal for the "distributed control"-concept (the counter part of the "distributed i/o"-concept) which is favoured by the BITBUS, which means transferring the intelligence into the peripherals: Each mCAT Task can also be a BITBUS-task - including dynamic downloading, activation and deleting. A driver for asynchronous transfer is available alternatively to the BITBUS. An isolated output with max. 1A at 30V can be used for example as "controller ready"-signal. In combination with the watchdog circuit, which initiates reset on voltage interruption or missing retriggers by the software (has to be initialized), an effective emergency-stop-circuit can be implemented. Eight inputs and eight outputs, both 24 V, in addition to eight analog inputs and two analog outputs, are available for the actual control task. Three terminals are available for each input, to enable a simple connection of supply, signal and ground, for example for ordinary (PNP) proximity switches. The inputs have an ESD, burst and surge resistant protection setup with low pass filter and optoisolators and show the input condition with red LEDs. Threshold values and currents are subject to the standards. 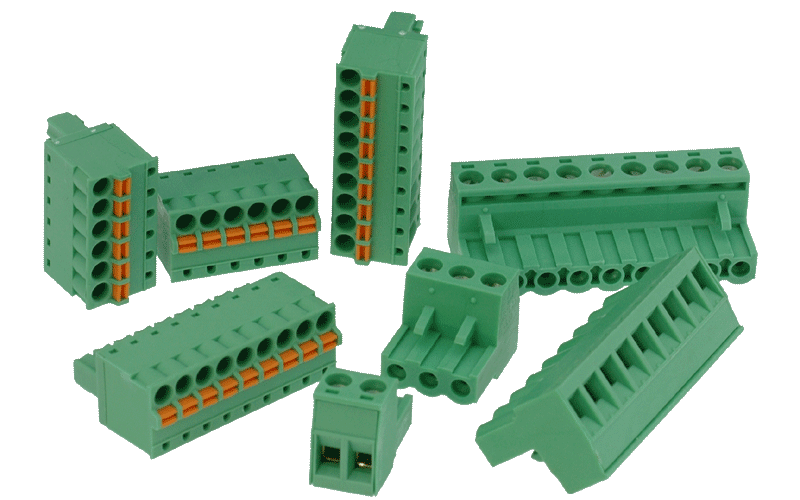 The eight outputs are p-switching (high-side), that means they supply a grounded load, what guarantees safety of accidental grounds in the cable. The outputs drive 0,7A each through the complete temperature range up to 70°C, but due to the connectors circuits not more than 8A altogether can be drawn. For use as PWM-output external freewheeling diodes are necessary, in order to prevent overheating of the IC. The outputs are optoisolated too; when fed by an isolated 24V-supply, loads at other voltage levels are switchable. Not only voltages between 0 and 5V can be applied to the analog inputs, with two DIP-switches at each input they may be used for 0..20mA process current or directly Si-temperatur-sensors (2kOhm) like KTY10 or KTY82. For the analog inputs, there is a separate power supply branch with reference and sensor voltage from a linearly controlled 12V-intervoltage. The TSM-CPUH2EA is optionally available with CAN-connection over a 9pin D-connector (configuration available at a surcharge). For information about available software please contact us. 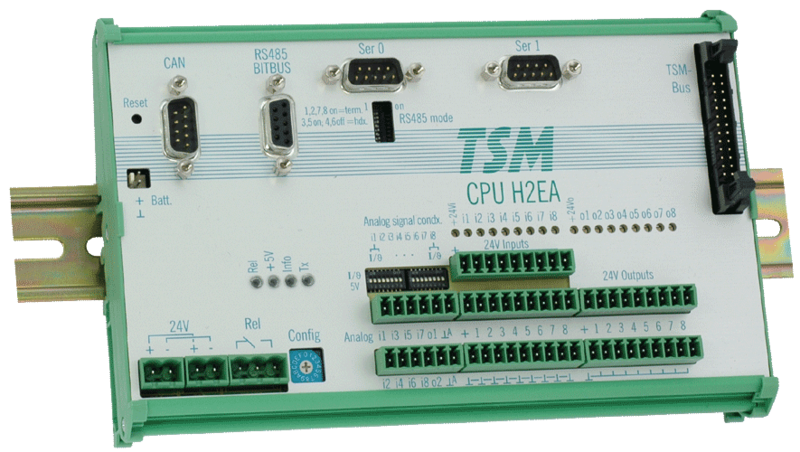 The largest configuration of TSM-CPU32H2 has a Profibus-Slave-interconnection at a surcharge, which is supported by mCAT. At the TSM-bus-connector up to 14 i/o-modules with a total power consumption of 3,5A can be connected.